The Somerset wind farm is extremely visible along the Pennsylvania Turnpike (I-76) corridor. Because of its visibility, the farm offers a unique opportunity to educate the public on wind power. The wind farm, consisting of six GE 1.5 MW wind turbines, began commercial operation in October 2001. 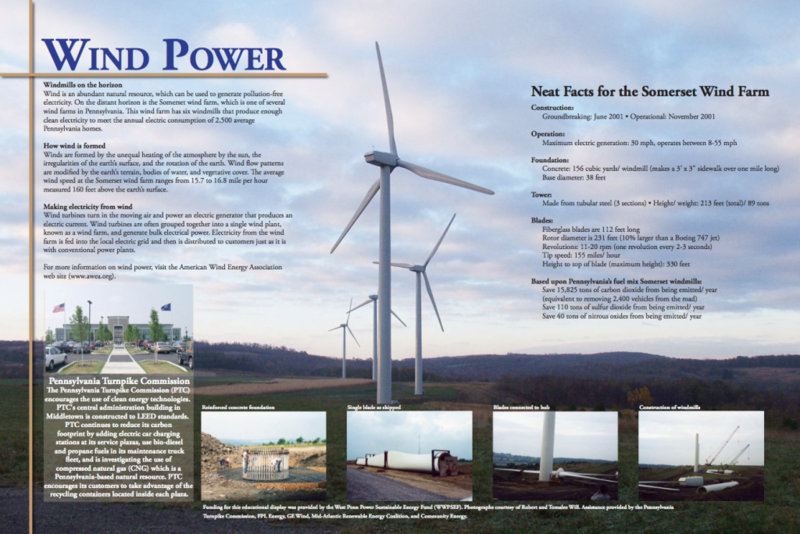 WPPSEF worked with Community Energy and the Pennsylvania Turnpike Commission to develop wind power educational displays for north and south bound Somerset rest plazas. Over 5.5 million travelers pass these rest plazas annually. Next time you pass these rest plazas, plan to stop and learn more about one of Pennsylvania’s earliest wind farms.